The guys over at www.djbattle.net have managed to lay their hands on a Technics DZ-1200 (something I'm still trying to do) and give it the once over - the outcome being a poor 6/10. Finding my mind wondering (it comes with age), I wondered about using something other than a regular turntable with the CDX-05/TTM1 combo. So I requested a Vestax Handytrax and what you see is the results of my old addled brain. Radio 1 DJ John Peel passed away last night aged 65. For those of you non-UK visitors, John Peel has had an immeasurable influence on the UK music scene and is responsible for many of the UK's finest artists careers and was certainly a massive influence on my musical education in the late 70's and early 80's. Following the competition on Turntable Radio to win one of four copies of the brand new Lamont break record, DJs from Earth, now has another 3 copies up for grabs to celebrate its release and also tie in nicely with Lamont's work with Rodec on manufacturing the new scratchbox mixer. To get your hands on one of these copies all you have to do is simply send in your name and address to this email address laurent@rawbeats.com and three names will be picked up at random. The competition closes on the 5th of November. For those of you who have followed for some time, you'll be aware of the development of a digital scratch product call E-Scratch. It's a product that was a long time in development but sadly it will never see the light of day. In yet another attempt at self humiliation, I've prepared for your entertainment a small selection of Vestax CDX-05 and Tascam TTM1 movies. Sorry people - just playing with a few things right now. Full news and comments appear in a popup. Let me know what you think. The plan is to have a smaller number of headline stories with a longer list of headline only links and a popup to see a full story. Holler with your thoughts. NickNack, maker of the Soundcraftsman v1 scratch tool, has released a movie showing how the record could be used in your compositions. First seen at PLASA 2003, and then at MusikMesse 2004 and now PLASA 2004, the Technics SL-DZ 1200 has certainly received it's fair share of attention - some good, some bad, some downright hating. Just to prove that you can actually scratch on these things, a short demo from PLASA is provided for your viewing pleasure. Just tidying up after PLASA and discovered a few snippets I hadn't posted yet - one of which is DJ Woody's Flutine set on the Vestax stand. I know it's been seen before on his site but in my book, you can never see this enough. It goes to show that you don't have to bust a 7 click euro crab flare orbit whatever to be a world class scratch DJ. Top UK urban magazine Undercover have made their website of the month in their "All Hands On Decks" section. 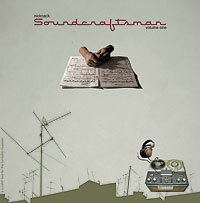 Slightly later than thought, the results are in for the Soundcraftsman competition. The luck winners are Will Amedume, Richard Linck and Michael Stutton. Congrats to you guys and better luck next time to the rest of you for the next Rawbeats and joint competition.